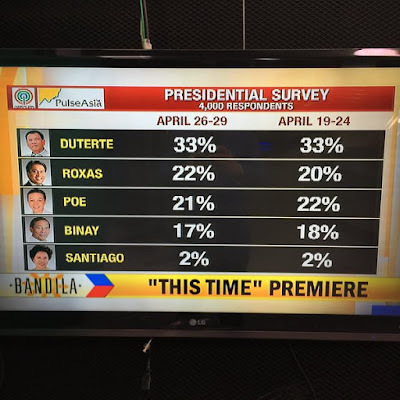 Less than a week before the May 9 polls, Davao City Mayor Rodrigo “Rody” Duterte of PDP-Laban maintained a wide lead over other presidential candidates in the latest Pulse Asia survey. One in three Filipinos or 33 percent of the respondents in the nationwide survey voted for Duterte as president, if the 2016 elections were held during the April 26 to 29 survey period. Duterte established an 11-point lead over Liberal Party (LP) standard bearer Manuel “Mar” Roxas II with 22 percent. Independent candidate Sen. Grace Poe with 21 percent, and Vice President Jejomar Binay of the United Nationalist Alliance (UNA) who garnered 17 percent. 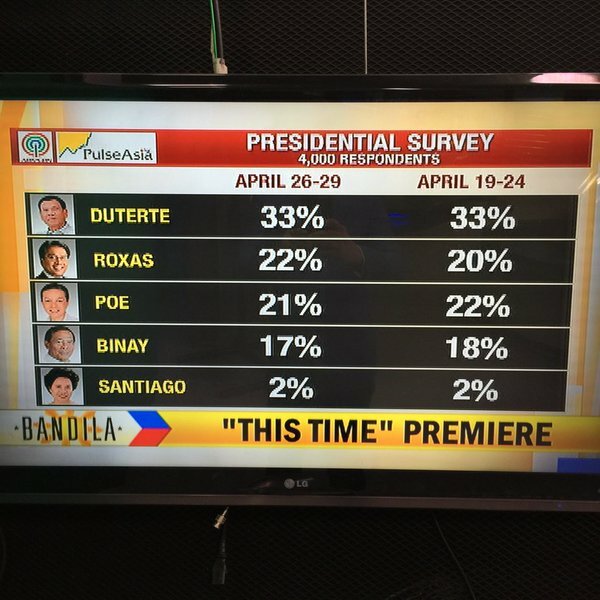 Poe, Roxas and Binay are statistically tied at second spot. While Sen. Miriam Defensor-Santiago still trailed far behind with only two percent. Malacañang behind BPI account issue? Roxas to make an announcement on Tuesday at 10 a.m.
Rambolan na! Maria Ressa attacks Jiggy Manicad: ‘Di ka sana makabalik sa media!